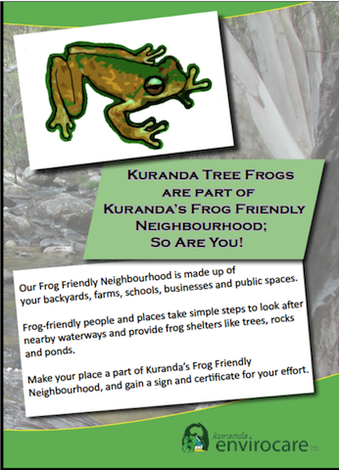 Take action at your place and you can be recognised for your part in making Kuranda a Frog Friendly Neighbourhood. Follow the link to book a frog friendly property assessment for your place. This involves looking after your local rainforest and stream, and taking action to improve it. Simple actions may include planting native rainforest trees, improving stream banks, and preventing run-off and changes to water flows. For an assessment of what could be done at your place, and help to get started, contact a friendly Kuranda Envirocare volunteer. Making ponds or dams does not help the endangered Kuranda frogs as they breed in flowing water and they will not use ponds. In fact, it may make things worse for them by assisting competitors (like toads) that love ponds and dams. Recognition includes a sign to display on your property and a certificate for you to keep. You can apply to have your actions recognised by downloading and completing an application form from our website – www.envirocare.org.au, or cutting out and returning the enclosed application form. To make sure we are being the best neighbours we can be, look at your local creek and ask these simple questions. 1. Is there a natural amount of water in the stream? The special Kuranda frogs need flowing creeks. Is something changing the amount of flowing water, e.g. pumping, damming, sediment build-up or storm water discharge? Changes to stream flow can be too much or too little water – both impact the frogs. Some creeks dry up in the dry season, and that’s ok because the frogs will use them when they flow in the wet. 2. What's in the stream (and what can we keep out)? Clean, clear healthy streams have low levels of sediment and are free from chemicals and rubbish. It is also important to keep introduced plant and animals species out. Introduced fish especially prey on tadpoles. 3. What's next to the stream? Is there native rainforest vegetation along the stream banks to prevent run-off and provide habitat for frogs? Is it wide enough to withstand edge-effects (e.g. weeds, drying out) and buffer the stream and frogs? Is it connected to taller trees and rainforest patches where the female frogs live? Are activities next to the stream impacting badly on it? The flow-on effect is very important. Things might be ok where the frogs are but upstream activities make their way down downstream. For example, sediment and chemicals flow downstream or damming starves downstream of water at crucial times. 5. What's happening at my place? Am I careful to reduce chemical and sediment run-off, even from washing cars, fertilising lawns and clearing weeds? Can I plant more trees that are native, reduce my use of poisons or take other action to be a better neighbour?